But beyond indulging my sugar cravings, I love Easter because it’s an excuse to get together with my family. My dad is a pilot, and as long as I can remember, we’ve been rescheduling holidays. If he was flying on Christmas Day, we’d have two Christmases, one on the 25th, and one whenever he got home. Thanksgiving? Not always on a Thursday, but always delicious. I think it’s because my family always made such an effort to make holidays special, no matter what day they really fell on, that makes me so fond of them now. 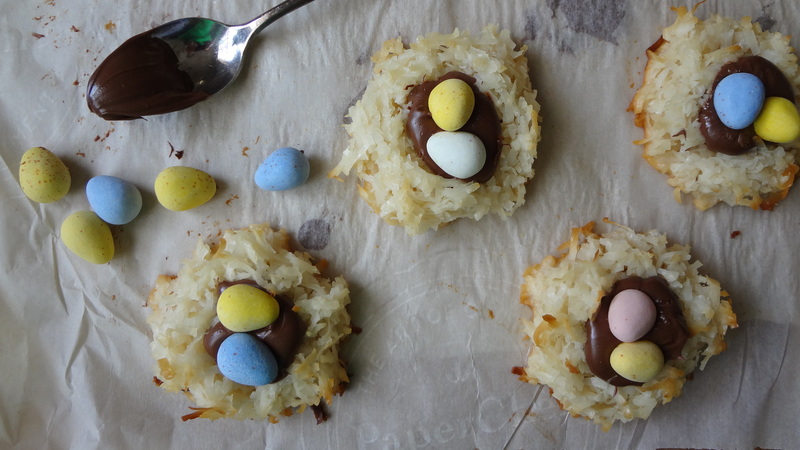 So if you’re getting together with your family for Easter, you should definitely consider whipping up a batch of these macaroons. They are so easy, they have great texture, and of course the Nutella filling in the nests is a bonus. What’s your favorite way to work in some holiday family time? 1. Preheat your oven to 325°F. Line a large baking sheet with parchment paper. 2. In a large bowl, mix together the sweetened condensed milk, egg white, vanilla extract, and salt with a rubber spatula until combined. Fold in the coconut and mix until the egg mixture is evenly spread amongst the coconut. 3. With a spoon, scoop up about two tablespoons of the dough and place the dough onto the prepared baking sheet. I use two spoons here, one to scoop the dough, and the other to help form a mound. Once you have a nicely rounded mound, press down the center in with your thumb to make the inside of the nest. 4. Bake cookies for 17 to 20 minutes, or until slightly golden brown. Remove from the oven and use a small spoon to push in the center of the nests again. Cool the cookies on the baking sheets for about 5 minutes or until they are firm and set. Remove with a spatula onto a cooling rack. Cool completely. 5. 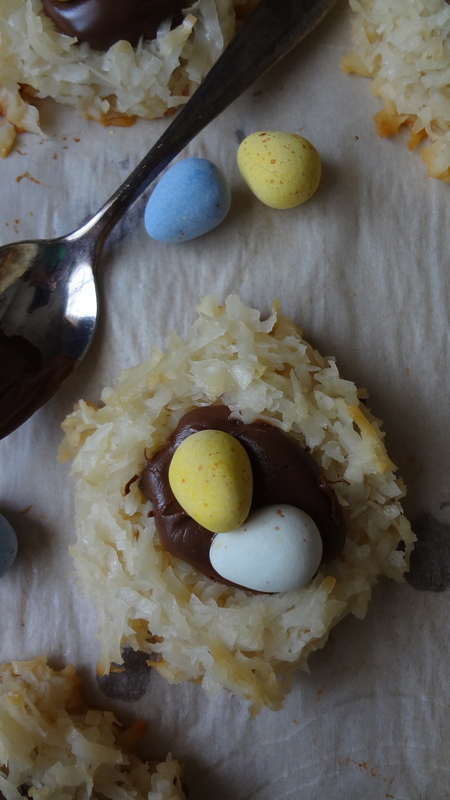 Place about a tablespoon of Nutella in the center of each nest. Place 3 egg candies in the center of the nest. You can store these in an airtight container for up to a week. 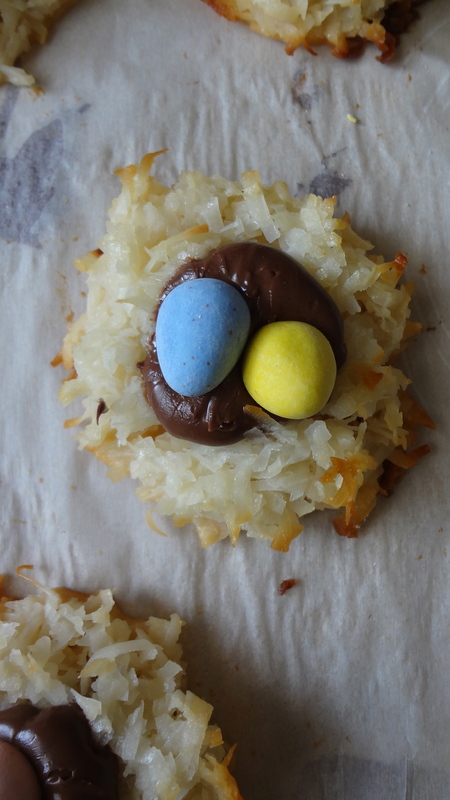 This entry was posted in Uncategorized and tagged Baking, Chocolate, coconut, Easter, easter candy, egg nest easter candy, egg nests, holiday baking, macaroons, Nutella by theculinarycapers. Bookmark the permalink. I hope i get them as pretty as you did, and will serve them this Sunday. My family is coming over to spend easter at our home. Have a nice easter! You are welcome, queenmunchie! Thank you for checking out my blog. I hope you have fun making them, and have a great Easter as well!